How seriously people participate in elections to elect their government ? Elections to a new parliament for Lebanon was conducted on June 07. BBC News reported that people have turned out in large numbers to vote in the election. The voter turnout was around 52% plus, a high figure for Lebanon. What happened to the remaining voters ? What were they doing, instead of voting during the elections ? In India, Election Day is declared as a holiday and most of the Indians without voting, enjoy this day as a holiday at home. 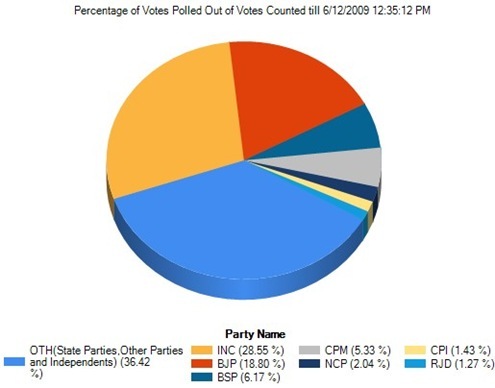 India had a five phase polling from April 16 to May 13. Thaindian News gives an account of what some Bangalore voters did on election day, as there is no beach in Bangalore. Absentee voters in other parts of India also must have spent election day as a holiday to enjoy. With 58.43% voter turnout, what is the out come in India ? India, the largest democracy in the world with 710,074,177 voters, is going to be ruled by Indian National Congress for the next five years with 118,457,668 voters (28.55% votes polled) in support of them.